IR conversion of live-view Sony? Quote Reply Topic: IR conversion of live-view Sony? Has anyone attempted this with a [Sony] camera with live-view? I have a NEX-6 now (with LA-EA2 adapter), and I don't really want to do surgery on it, but I am slowly building my Sony/Minolta lens base, so a Sony body makes the most sense (can be NEX or 'normal' Alpha body). I'm specifically interested in live-view bodies so that I can take advantage of focusing if shooting IR only (with an IR filter on the lens). The previously-mentioned tutorials replace the IR filter on the sensor with clear glass - which is genius! - which allows you to fiddle around with whatever spectrum you like (including 'normal') by using filters on the lens (because, recall, there is now no filter on the sensor). BUT, with an A100 (or any other body without live view) you can't focus with the dark IR filter on the end of the lens (because there's no live view of what's hitting the sensor - which is only IR light... which we can't see with human eyes through a normal viewfinder). So, that was a long explanation for what you probably already knew , but... does anyone have any recommendations or personal experience or a link to another tutorial for live-view cameras? I have NEX-3 without IR filter on a sensor. Even with SEL 16mm, I shoot in MF only. Focus peeking works great. I shoot BW jpegs + RAW, so I see "normal black & white" live on the screen and can play with "open spectrum" RAWs in post production. For proper IR photography just put an IR pass filter on the lens. I did DIY conversions of NEX-3 and NEX-5N long ago. I have recorded the process with pictures and can give You the link later on today. Pete Ganzel did the same with NEX-5. Please note that, besides a much larger choice of lenses that can be adapted for NEX cameras comparing to SLR, there is one more important advantage - You can put the filter between the lens and the camera, inside the adapter. Very important if You want to use fisheye lenses and other lenses without front filter mount, or with very large front elements. Here is my full-spectrum converted NEX-3 with 21mm wide angle lens. One of the filters I use only comes in 1.25 inch and 2 inch diameters, so the only way to use it with such lens is to put it inside the adapter. I am planning to get myself a NEX-&in the nearest future, and convert it to full-spectrum. WOW! That photo is STUNNING... and exactly the sort of thing I'm after (read: what I aspire to do)! Actually, if I end up pulling the trigger on this setup, I'm going to also spring for the Sigma 8-16mm [Alpha-mount] lens to see what ultra-wide IR can do! Thanks for also confirming the focus-peaking usability. For that and other reasons I was leaning toward a second NEX body rather than an SLT Alpha. Ok, now I am officially SOLD on the idea!! I never thought about the filter-in-the-adapter idea... GENIUS!!! How does this work, exactly? I see you have an non-Sony adapter... that's what I'll get for the second body too since there's no sense wasting the SLT technology and motor drive of my LA-EA2 if I plan on manually focusing anyway. But where does the filter FIT in the adapter without interfering with mounting on the body or lens? Wow - I am still excited about this!! ONE set of filters!! BRILLIANT!! And yes, PLEASE, PLEASE, PLEASE send me the links to your conversion (and Pete Ganzel's if he posted one as well) at your earliest convenience. And what model NEX are you considering in the future? I think you might have fat-fingered the model # in your previous post. I will post some pictures of the adapter later tonight, as well as the links to DIY conversions. NEX-6 will be my next full-spectrum camera. I love using EVF. Thanks, Alex. I was guessing that you were going to say NEX-7 for the increased megapixels, but I love my NEX-6, and can understand your choice! But I'm still curious... if it's just the EVF you're after, why not just get a FDA-EV1S for your 5N for a fraction of what an NEX-6 will cost? EVF, flash shoe, better manual controls. I will sell my NEX-5N to recoup some of the expenses anyway. Hmmmm... I happen to know a guy who is interested in a full-spectrum NEX body!! I would have two bodies, one for normal and one for infrared/ultraviolet/false color work. The reason is simple. If You want to use a full-spectrum converted body to shoot "normal" pictures (in visible light) You need to use a special filter too. The one that blocks IR AND UV (UVIR-cut) and which transmission curve is the same as the curve of ICF (internal cut filter) that was removed from the camera originally. Unfortunately, spectral transmission of proprietary ICF is not the same as for the generic UVIR-cut filters. The spectral transmission of proprietary ICF is used by software engineers when creating color profiles for proper RAW conversion in camera and in software. Simply speaking, if You use generic UVIR-cut filters for normal photography with full-spectrum modified camera, the colors will be off. You would need to use grey card and color standards to create color profiles for different shooting conditions. That is not convenient at all. Your explanations are clear, concise, and perfect for newbies like me. Thank you! Feel free to PM me if interested in unloading your FS 5N! I'll weigh the cost vs. fear when I read your tutorial for conversion! And not only from a photographic perspective... The very first picture I clicked on (the Taras Shevchenko monument) I immediately recognized without even seeing the caption! I've been there!! My wife was born and raised in L'viv, and we were married there 10 years ago. Small world!! Hi Ron, small world indeed (my wife is from FL and we met and got married in LA). As for the adapter, here is what I use. The picture above is a Canon-EF to NEX adapter. These adapters usually are wide enough to insert 49mm or 52mm filter deep inside, unlike adapters for M42 for example, which are narrower. But also, with another adapter I can use Nikon, Olympus, Exakta, M42 and other lenses with this adapter. To firmly affix the filter inside I use black self-adhesive neoprene foam. I think I got it in Michaels in US, but am not sure. Just cut a thin strip of foam, as wide as the filter ring is, and wrap it around the filter ring. Do not overlap the foam, but cut it at an angle where edges will connect to prevent light from leaking. When inserted in the adapter, this foam holds the filter inside, but also seals the edges and prevents light from leaking. Hope it helps. Will be glad to answer any other questions. Like Alex H, I also did a DIY conversion and removed the hot mirror of my NEX-5N (full spectrum conversion). And now using lens screw-on filters: IR or UVIR-cut on the SEL18-55 kit when shooting. Small little combo which is a joy to use whether in AF or MF (+focus peaking). The disassembly like shown in the Alex' gallery is quite simple. The only tricky thing is when everything is assembled again and the LCD backpanel is, in the last step, attached to the body again and thereby the LCD ribbon cable needs to be lock in its connector on the mainboard again. 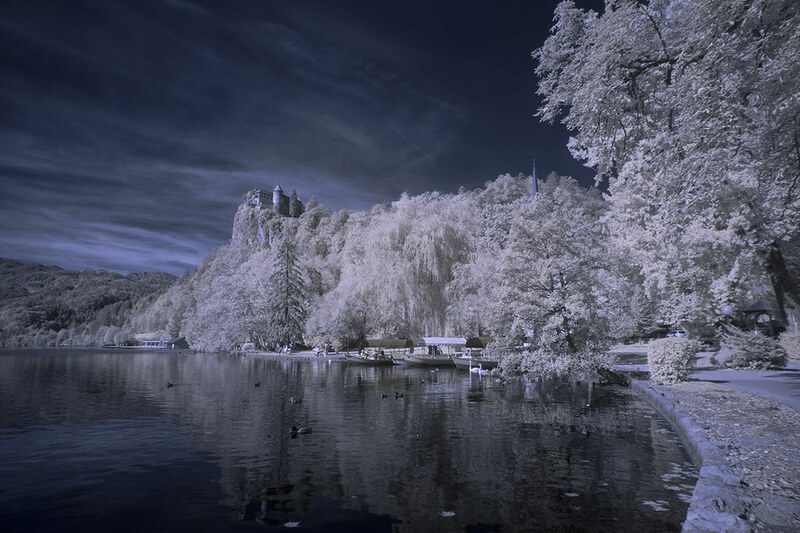 IR pictures taken with this NEX-5N and Heliopan RG715 IR-filter can be seen in here.